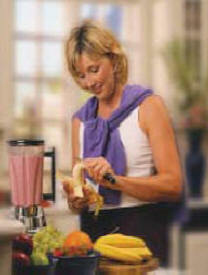 Herbalife’s approach to weight management is about creating a healthy balanced way to eat and live. It starts with a foundation of eating a nutritionally balanced and varied diet, making time for regular exercise. Formula 1, Formula 2 Formula 3, Fibre and Herb are at the core of Herbalife’s programme; suitable for those who wish to lose or maintain weight. Convenient, great tasting and scientifically proven in clinical trials, Herbalife weight management products can help you reach and maintain your ideal physique. Millions of people around the world start their day with a Formula 1 Shake personalised to suit their taste preferences. Some add extra fruit or yoghurt and choose to use soy or rice milk rather than dairy but the possibilities are limited by only your imagination! Keep an eye out for our favourite Formula 1 Shake recipes for more inspiration. If you don’t have time to make a Shake or eat a nutritionally balanced meal then it makes sense to grab a Formula 1 Express Bar which contains all the goodness of a Formula 1 Shake in a convenient and tasty format which you can keep handy in your bag, desk or car. ShapeWorks ™- Herbalife offer personalised solutions tailored to your individual needs and can help you achieve weight management goals to suit your individual shape, body composition and life style. Use the ShapeWorks programme to help you manage your weight and bring out your best possible Shape! ShapeWorks™ QuickStart offers you the core products for effective weight management. The kit contains Formula 1 Nutritional Shake Mix, in a choice of six delicious flavours, Formula 2 Multivitamin Complex to support good health during the weight management process, Formula 3 Personalised Protein Powder, to help ensure the protein intake that is right for you, and Fibre and Herb to help flush out toxins and waste. The key benefits of the ShapeWorks Diet? Herbalife shakes keep you going much longer than breakfast cereals! You have an independent Herbalife distributor in Birmingham/ Solihull to assist you to lose or maintain that weight. Herbalife Sport Drink - NEW H30 Sports Isotonic Drink provides essential electrolytes to increase the rate of fluid absorption and support cellular hydration. Energizing carbs for immediate and sustained muscle energy plus powerful antioxidants that neutralize free radicals to protect against muscle fatigue and soreness.